This week latest iPhone 5 will become available for public and the first time I am thinking about buying smart phone. Yes, I still don”t have neither iPhone, neither Samsung Galaxy as I didn’t want to waste my time everyday by looking where to charge that smart phone. Up to now I was happy with simple cellular phone without any advanced features with standby time for two weeks. Thought during one of my last trips to London Olympic Games I started to think about smart phone purchase. It was so many information online: games schedules and results, available tickets, traffic information, sightseeing routes and etc. I could carry laptop or iPad, but I like to keep my backpack very light and smart phone would be perfect choice. Of course such events like London Olympics doesn’t happen very often and I still could survive without any smart phone, but features of the latest iPhone 5 made me think again. May be I should get one? iPhone 5 has improved iSight camera and with new A6 chip it will capture photos quicker. The new panorama feature lets you shoot up to an impressive 240 degrees high-resolution panorama up to 28 megapixels. New camera with improved video stabilization helps record stunning 1080p HD video. This camera won’t change my Canon DSLR, but I really started to think iPhone 5 could be replacement of my P&S camera. Apple ditched Google Maps and introduced its own Apple Maps application. It is new product and still there are no reviews, but I hope it will be good and will require less bandwidth. Maps application is done in partnership with TomTom know as world’s leading supplier of location and navigation products and services. 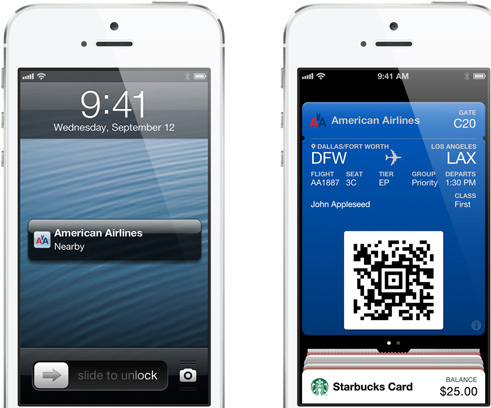 Passbook application is the most interested new application in latest iOS 6. In the middle of this year Apple announced its Passbook program which could replace all tickets and gift cards in your wallet. But most importantly it can store your boarding passes, so you won’t need seek printer during your travels. With Passbook, you can scan your iPhone to check in for a flight. Wake your iPhone and passes appear on your Lock screen at the appropriate time and place when you reach the airport. If your departure gate changes after you’ve checked in for your flight, Passbook will alert you to make sure you’re not relaxing in the wrong terminal. This application seems will be irreplaceable companion for a lot of frequent travelers. Of course it will take some time until major airlines adopt this technology. American Airlines, Delta, United and Virgin airlines are among the early partners and hopefully other will follow. Will I buy iPhone 5 tomorrow when the phone will be released at Apple store? I am not sure yet. I probably will wait for more reviews of all these application I am interested in, but I feel I will buy one at the end. It seems travellers should wait with purchase of new iPhone, as there are lot of problems with their mapping application. You can check some reviews here and here. Surprisingly bad quality of satellite shots and it give wrong directions. I can’t wait to get the new iPhone, but I’ve heard about the problems with the maps too. I’m sure Apple will iron them out soon though. I think the Passbook idea is great. I hope they fix that ASAP. I just can believe they did such mistake. While the maps application might not be the best, there are so many useful apps for traveling that really make the smartphone worthwhile! Can’t imagine traveling without it!